When it comes to public transport, politicians love making promises that they never intend to follow through with – but in the case of the Bayside Rail Project on the Frankston line, the decision to actually pursue the upgrades has led to an unexpected bonus – clean trains. “Since the November 2010 election, the Coalition Government has announced orders for 15 new X’Trapolis trains, but these trains could only carry passengers on the Alamein, Glen Waverley, Belgrave, Lilydale, Hurstbridge and South Morang lines due to the different position in which the driver sits in the cab, affecting the ability to see some signals. “This $100 million will mean the Frankston line will also be able to accommodate the X’Trapolis trains, giving passengers the fastest, most reliable and most comfortable commute to and from the city,” Dr Napthine said. May 2013: because trains on the Frankston line run through to Williamstown and Werribee, the scope of the upgrade works had to be increased to cover these additional lines. October 2014: a token X’Trapolis train services was added to the Franskton line before the 2014 State Election, but had to be speed restricted due to level crossing issues. September 2015: due to the modifications made to level crossings to enable the operation of X’Trapolis trains, boom gates on the Frankston line will stay down for longer. But one that slipped through to the keeper was the promise that the X’Trapolis trains being “new” was a good thing. Here is a typical X’Trapolis train. Notice how downright filthy and graffiti covered the passenger saloon is? For politicians, assuming that a “new” train provides a clean and comfortable travelling experience for passengers is an easy mistake to make. However in the real world of Melbourne’s rail network, anything “new” is going to be completely trashed in next to no time, and stay that way thanks to a lack of regular maintenance. It appears that somebody pulling the strings also realised how filthy the X’Trapolis trains were, as in August 2015 Public Transport Victoria announced a $2 million project to refurbishment the entire fleet of X’Trapolis trains. The X’Trapolis train fleet will undergo a major internal refurbishment and graffiti removal program to help deliver a cleaner and more reliable service for customers. The interior of the 80 X’Trapolis trains will be refurbished to remove all remnants of graffiti. From 14 August 2015, one refurbished train will be delivered to the network each day. an upgrade of internal lighting (brighter lighting). To keep the trains clean after they’ve been refurbished, there will be more regular checks and monitoring of CCTV to remove any new graffiti as quickly as possible. The end result is a train that actually meets the expectations of the average commuter. The clean-up will not extend at this time to the Siemens and older Comeng trains. It takes some skill, but the politicians of Victoria have managed to link clean trains to marginal seats. Marcus, any view on how well the new anti-graffiti coating actually works? And whether they are actually removing new graffiti as promised? And most importantly, are they replacing the protective film on the windows when it gets scratched (as it’s designed to do), rather than the current misguided view that it somehow “protects” the window. Given that the film is much easier to scratch than glass, it actually makes the scratching problem worse unless its replaced often. I rarely catch trains (but catch trams every day), so can’t check this out myself. For the X’Trapolis trains, I don’t regularly travel on them, so can’t add much on that front. 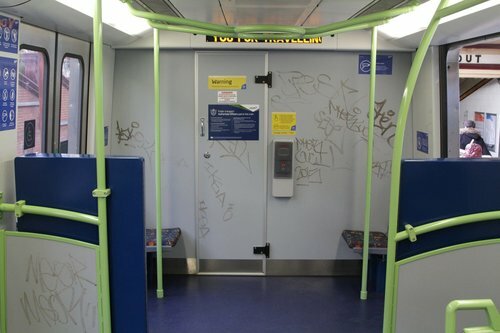 However I’ve seen a few Siemens trains that have had the interior repainted and new anti-scratch film on the windows – but not enough yet to say how well it is standing up to the scrotes of Melbourne. Not really on topic but I feel like the last sentence (“politicians of Victoria have managed to link clean trains to marginal seats.”) is a great pun opportunity gone begging! I’m not too sure the “clean” trains factor is part of the scope of works for the Bayside Rail Project, as the Xtrap fleet has its own funding project created. But for the internal rejuvenation project of the Siemens Fleet which has been going on for the past 18 months, I believe is tacked on as part of the internal reconfiguration project(removal of some seats & wind barrier to make the door area bigger to increase the standing capacity and adding grab bars) as both projects kinda go hand in hand. I’ll disregard the initial phases where the fleet went through a Mickey Mouse clean by a cleaning contractor whom enlisted the elbow grease of cheap labour, steam scrubber and some cleaning chemical cleaned each unit on a ~6 hour process of a more thorougher standard as say the nightly post revenue run clean. But the actual “deep clean” aka. half life project as its called, is pretty much the same as the Xtrap project but if you wish to read about the step by step process here it is.. The project entitles removal of all assets in the internal saloon area (you be very surprised how roomy a carriage completely stripped) with the exceptions of emergency PED, ceiling panels, CCTV and lighting.. and also the PID at the end of each carriage. Removal of heavier scratched saloon windows (most units saw around 90%) and door windows (98% removal rate) and replaced with new ones with the anti vandalism film already added, the ones not removed had the film added on site, some which has light scratching jut simply have a contractor “buffed” out the scratch which is a very common thing/process with shop fronts windows prior to insertion of the film. Then having a bear carriage it goes on to the respray of this anti vandalism paint as per stated on this article (not surprised same contractor who is doing the Xtrap fleet. Side note: This painting process generated some controversy, as part of the project saw a upgrade of a unused section of the former test track at Newport Workshop (parallels the Willamstown Line) where a high security compound was erected and two shipping containers placed all so the painting of this anti vandalism paint can be applied, because of its close proximity to some residential dwellings saw this project briefly (couple of months) done at North Melbourne wash plant road while the environmental impact issue was being sorted out. Upon return the unit then under go the reconfiguration part of the project, which includes the change of seat fabrics (station names) if it hasn’t been changed prior when the new layout of seats was placed back. Finally prior to entering revenue the filming contractor returned by adding the anti vandalism film to the cab windscreen both external (obvious reasons) and internal (possible part of mitigation from the near miss to the driver a couple years ago who unfortunately had a passing Comeng brake block fling into the top right corner of the Siemens train at speed near Hoopers Crossing, while the block didnt go through due to the fact most of the block hit the fiberglass but what did hit windscreen glass did cause traces of shards of glass to be detected inside the cab). To answer the last comment’s question does the anti graffiti coating work? well IMO it’s probably as good as the coating when the unit first rolled out in 2000-1-2 whenever. As for you comment on the asset protection of the film, pretty much bingo.. make no mistake it doesn’t deter the vandalism the level is the same or steady increased in fact the level isn’t measured because it’s a non bookable fault by the drivers when it does occur, the only exceptions is “offensive” words scratch then it warrants removal where in the past it’s entire glass replacement which = $$$, now given it’s not a deep scratch (in theory its most cases) its a matter of replace film or quick buff out, also I guess one to for MTM to pat each other’s bum on is the film also acts as a safety feature for the passengers in a case of a “rocking” incident. But how long will they last clean? Any word that this will become a “rolling” deep clean, like when all 80 X’Traps are done, they’ll start again? Can’t speak for the Xtrap, but most likely the same procedure. On the Siemens fleet once the unit has the project completed it the new stardard applies in terms of looklike brand new. So any graffiti will be removed by cleaners as per normal proccedure, if “ghosting” occurs or if someone decides to scratch the paint then it gets escalated and returns to the workshop to be patch painted. Same with the windows where the film is removed and replaced or if its a deep scratched then old proccedure of glass replacement. Side note: MTM is yet to roll out for staff to be trained to remove and apply the new film so at the moment you’ll find the units with scratch windows are allowed to run revenue services until its due to return to workshop a/c of planned maintenance where then a contractor does their magic. How long will this last… given its a endless battle one might think eventually it will resort back to old proccedures when it becomes un-economical. Thanks for the comprehensive information Dark Knight. I’m not 100% clear on what you’re saying re windows films – is it that there is a *new* policy to replace the film when it gets scratched (but staff haven’t been trained to do it yet)? Or was that the existing policy? Because, if it was existing policy it certainly didn’t work – so many trains with film on the windows ran around with terrible scratches. If it is new policy, do you know what the criteria is for film replacement? Is it *any* scratching, or just “heavy” scratching? I really hope that they get on top of this. Last time I was in NY I barely spotted a single scratched window. And that’s saying something considering the state that the subway used to be in. So it can be done with the right willpower and procedures (and staff training). Saloon Windows previously never had a “anti vandalism” film added from the supplier this is a new batch/part (the window glass comes prefilmed) and only applies to the reconfigured units which if you look at the saloon window glass there should be a little “anti vandlism film” sticker. May I add, as addition only a small handful of units have “half life” project completed (IIRC 22/72 to date) only they have the new proccedure and policy applied rest is status quo. Status Quo would be only replace (so entire window glass) if smashed, chiped and to the topic has something “offensive” scratched, hence why currently and always been the case scratched windows are left as they are. Now new policy so in regards to the windows with the film, the idea is just like NY, if any scratch is found it will be removed (currently by contractor) either by buffing method or re-filming so it “remands” looking new. Obviously for job security and practicality reasons internal MTM staff will be the ones who will be trained in film removal and applying just like replacing the actual window glass if the scratch is found to be deep and is on the glass itself, in terms the ETA of that training program begins as well as tools being supplied to do the job… yeah next question, same goes with the green light to have internal staff do the patch up paint work on the new anti vandalism paint on the panels. I know the funding for the X’Trapolis deep clean was separate to the funding for the Bayside Rail Project, however I believe this clean was very much linked. The 8 “brand new” X’Trapolis trains for Frankston at the completion of the Bayside Rail Project are all already in service, being ran in and made filthy dirty on the lines these trains already run. They are NOT going to be new trains when Frankston begins regular running of X’Traps. Also to note is the fact these new trains are now all mixed with older sets. 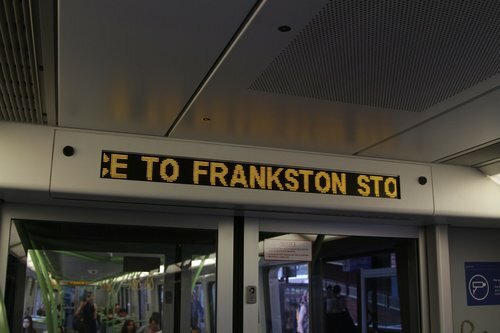 How can X’Trapolis trains be allocated to Frankston in the state they were in? When X’Trapolis trains do shortly go across to Frankston, they will more than likely be any X’Trapolis rather than the newest by number. Thus, needed a deep clean associated with this project. Working in Perth on a contract job at for the past year over from Melbourne it was a bit of a shock to see the clean trains over here at first – even the older A-series trains from the early 1990’s (admittedly with reconfigured seating along the sides to make more standing room). Same goes for the stations without graffiti in the platform pit and substantially less in the corridors. 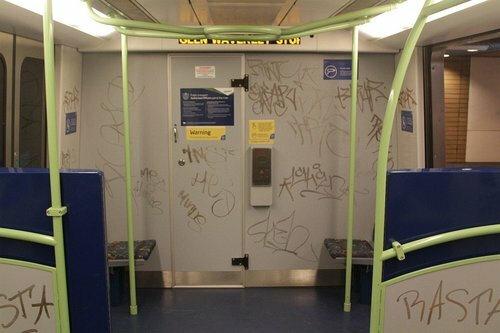 In Melbourne you get graffiti-stained ends of carriages behind the driver compartments – particularly the Siemens trains but the XTrapolis sets are catching up fast as per this article. Windows (the film covering that is) on trains and trams are also etched everywhere as a semi-permanent fixture too. 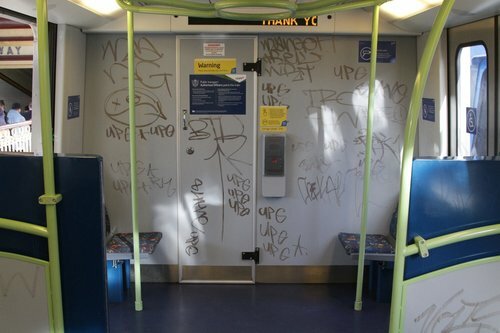 NSW trains use special electronic chemical sensors which detects the vapour of both spray paint and marker pens to catch law-breaking graffiti vandals. Singapore literally cane graffiti vandals and foreigners in Singapore who are caught doing it say “we did not know the punishment is that severe, please spare us the cane”!